Atlético Madrid is one of the biggest Spanish football clubs even that its existence most of the time have been foreshadowed by the giants Barcelona and Real Madrid. Club Atlético de Madrid, which is the full name, has played the role of the little brother to Real Madrid and being the team that always strive to upset the order. The club has also been notorious for a remarkable high incidence of sacked managers. Trophies in the Museo Atlético Madrid. The club was founded in 1903, under the name of Athletic Club de Madrid. Its founders, three Basque students living in Madrid, considered the club a youth branch of Athletic Bilbao. The club first shirts with blue and white shirts were probably inspired by Blackburn Rovers. Eight years later they would change to red and white shirt and this time by the influence of Southampton. The heritage from the first kit lives on with the blue shorts. Following the end of the Spain civil war in 1939, Athletic was merged with a Zaragoza football club founded the same year, Aviación Nacional. The new club was named Athletic Aviación de Madrid. The merger quickly proved successful, as Athletic Aviación managed to win its first La Liga in 1940 and defend the title in 1941. In 1947, the club changed its name for the final time; it was henceforth known by its current name of Club Atlético de Madrid. The 50s started off well for Atlético Madrid, as the club won two more La Liga titles under the leadership of the Argentine Helenio Herrera. After his departure in 1953, however, the club had to settle for being the third best club in the country for the rest of the decade, behind the untouchable Real Madrid and Barcelona. The next two decades were dominated by a fierce rivalry between two Madrid clubs, Real and Atlético. With both clubs enjoying their primes, the Madrid derby was seen as a fight between the wealthy citizens and the working class. During these two decades, Atlético managed to win four La Ligas (1966, 1970, 1973 and 1977), five Copa del Rey trophies (1960, 1961, 1965, 1972, 1976) and a Cup Winners' Cup in 1962. Under the management of Juan Carlos Lorenzo 1973–1975, Atlético would be granted the ill sounding nick name "animals". The nicknamed came after the European Cup semi-final against Celtic. Atlético achived a goalless away draw, but the match is more remembered for Atlético’s method of winning, which resulted in three Atlético players sent off, most of the other players seeing yellow cards and the opponents were given 51 free kicks. Atlético would after a win in the second leg advance to the final and there face Bayern Munich. It all ended with a victory for the Germans. The club had to wait until 1987 and Jesús Gil's appointment for president for its next rise to prominence. Even though Gil started spending large amounts of money on big-name signings, his ruthless philosophy of changing the coaches at a rapid rate did not yield results right away. After having to settle for two Copa del Rey titles in 1991 and 1992, Atlético finally won its long-awaited ninth La Liga in 1996, following it up with another Copa del Rey trophy. Gil's reign came to an end in 2000, due to many lawsuits against him and the club's board. With a number of financial issues surrounding the club, Atlético was relegated the same year. 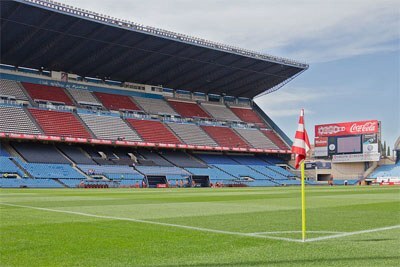 Estadio Vicente Calderón, home ground for the team 1966–2017. Diego Simeone's appointment as head coach in 2011 saw the club return to its former paths of glory without really big stars, but with the idea of collectivism. Under his leadership, the club won a Europa League in 2012, and followed it up with a Copa del Rey in 2013 and its tenth La Liga in 2014. After the team's victory in the UEFA Super Cup 2018, Simeone became the most successful manager in the club's history. The club's missing trophy is that of the Champions League. Athlético has been close to win it, being runners-up in 2013–14 and 2015–16 plus reaching the semi-finals in 2016–17. The logo that Atlético Madrid is associated with today was designed in 1917 and pictures a bear standing on his hind legs and leans against a Madroño tree. Since when, the logo has been simplified and have nowadays less white and red stripes than the original design and also a slight different shape. 1903 The club is established (as Athletic Club de Madrid). 1912 The team change to red and white shirts. 1929 First season in the Primera División. 1939 Athletic merge with Aviación Nacional. The new club is named Athletic Aviación de Madrid. 1923 The club move to the Stadium Metropolitano. 1940 First time national league champions. 1947 The club is renamed to Club Atlético de Madrid. 1948 The first foreign player is transferred (Larbi Ben Barek, Morocco). 1959 Winning their first Copa del Rey trophy. 1962 First European cup trophy (UEFA Cup Winners' Cup). 1974 First European Cup title. 2010 First UEFA Europe League title. 2014 First Champions League title. 2017 The club move to the Wanda Metropolitano Stadium.